Groups help you organize devices and queries in the console's Network View. You can create groups to organize network devices based on function, geographic location, department, device attribute or any other category that meets your needs. For example, you could create a marketing group for all devices in the marketing department or a group that includes all devices running a specific OS. 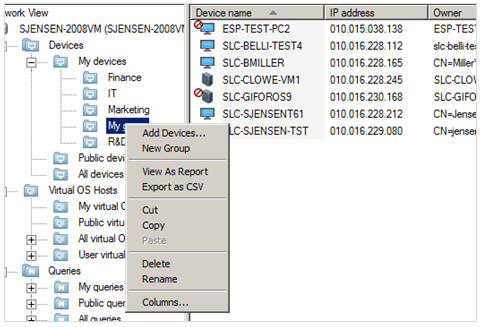 My devices and My queries: Administrators and all other users can create groups under My devices and My queries. Public devices: Only administrators can create groups under Public devices. Public queries: Only administrators or users with the "Public query Management" right can create groups under Public queries. All devices and All queries: There are no subgroups in All devices or All queries. Users, including administrators, can't create groups under All devices or All queries. In the console's Network View, right-click the parent group (such as My devices), and then click New group. Or, select the parent group, and then click Edit > My Devices > New Group. Type in a name for the new group, and then press the Enter key.